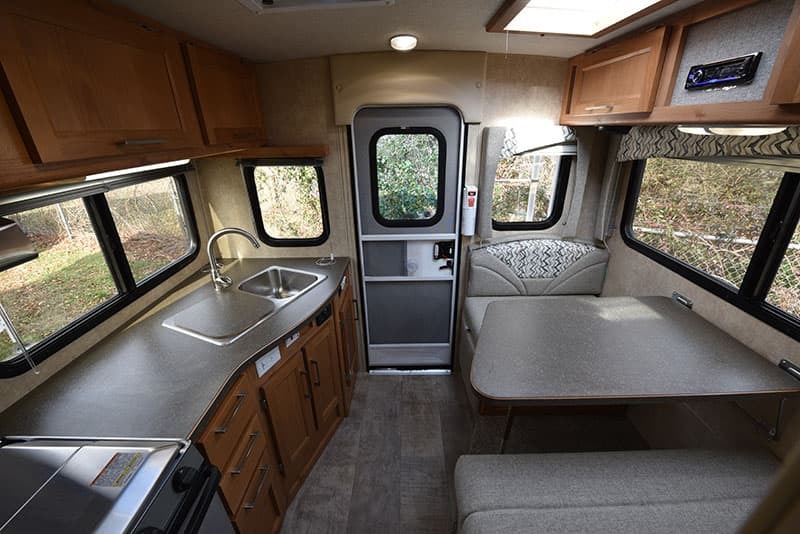 The Bigfoot 25C10.4 has a very open floor plan for a non-slide camper. With the kitchen and the dinette in the back, there is a beautiful panoramic view. Standing just inside the entry way door you see the booth dinette on the driver’s side, the kitchen on the passenger’s side, the mid-dry bath and refrigerator in the hallway, and the cabover. 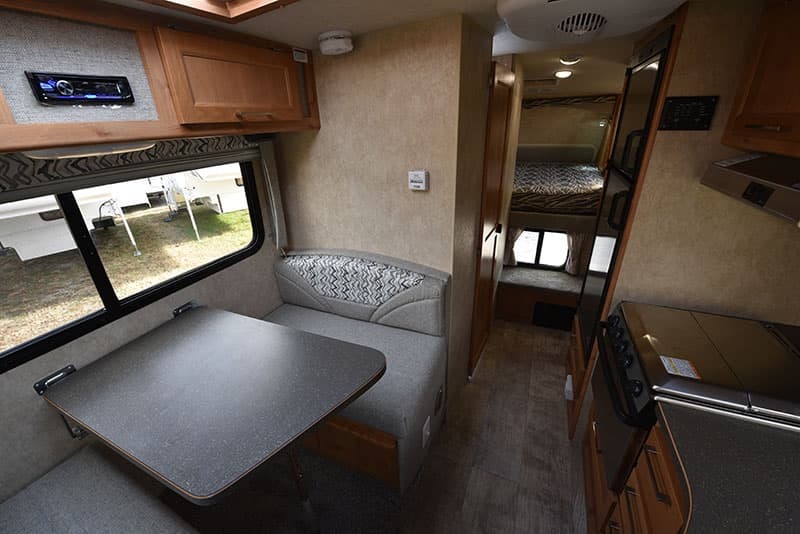 While this in an attractive layout, the real magic of the Bigfoot 25C10.4 floor plan appears when you stand mid-ship and look toward the rear of the unit. From there the Bigfoot 25C10.4 offers a stunning 180-degree rear panoramic view. Just look at the open and amazing vision you will enjoy everywhere you go. There are very few truck campers that offer this quality of rear panoramic experience. First, many hard side truck campers have their bathrooms in the rear. Second, most mid-bath models don’t have five rear windows, or use small windows that don’t offer the view quality available here. 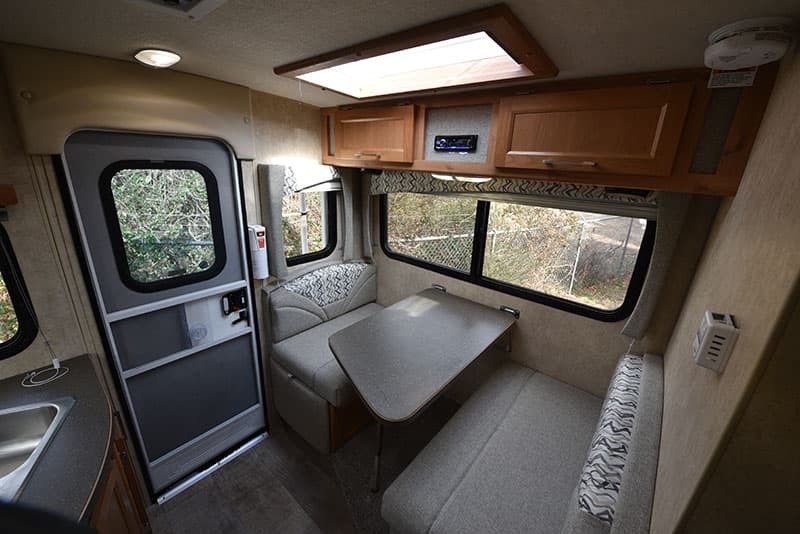 In our opinion, the Bigfoot 25C 10.4 has the best rear panoramic view available on any truck camper on the market. This is a feature you’ll enjoy everywhere you go. Imagine having breakfast, lunch, and dinner with this kind of outdoor light and visibility. 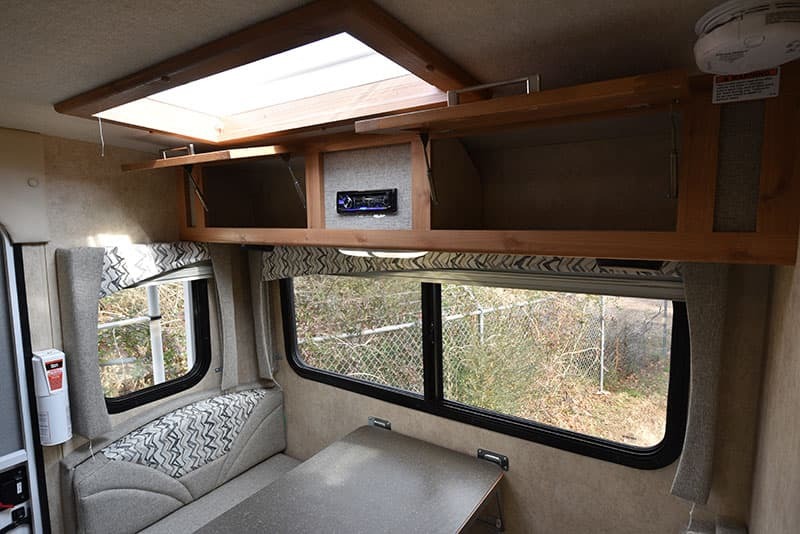 The large skylight over the dinette adds even more natural light. Simply stunning. 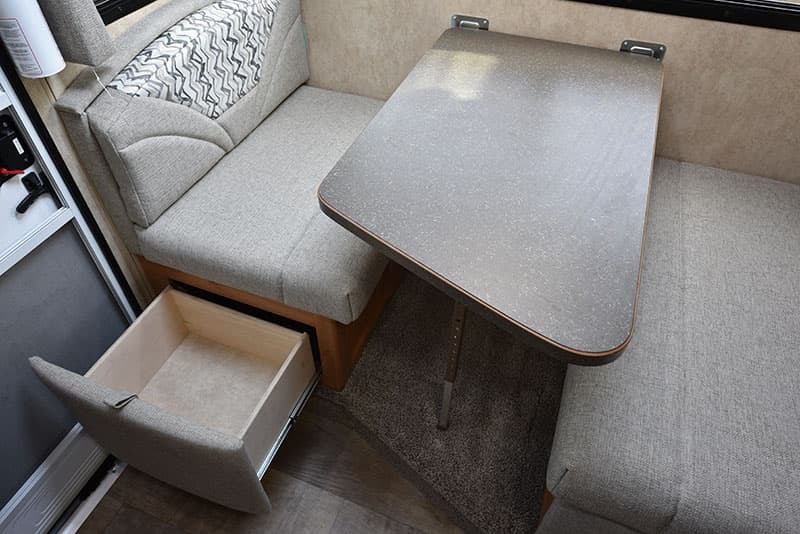 The driver’s side booth-style dinette is asymmetrical with a smaller seat against the back wall and an angled table. This design accommodates the doorway and the protruding kitchen counter and sink area. 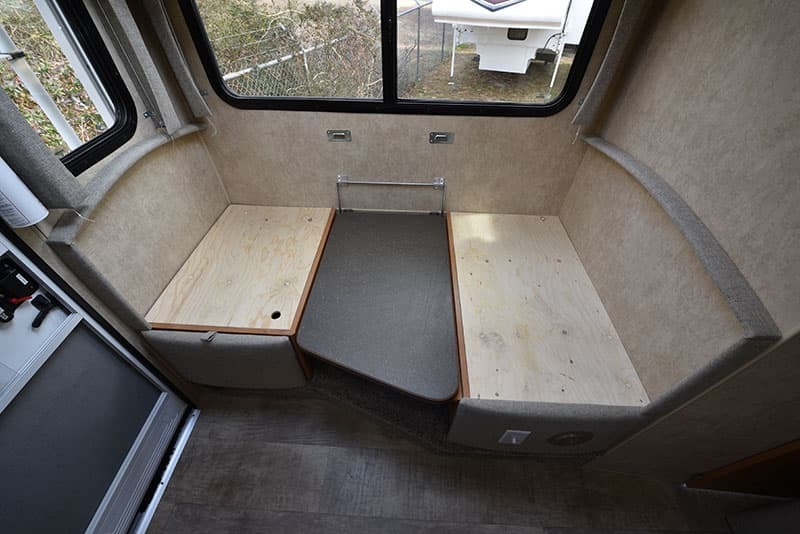 Since the great majority of truck camper owners are couples; the shorter seat and angled table are smart compromises. If you have more people, you could put a stool in the hallway, or just squeeze in. I would be curious to see the table not angled. I don’t believe a full-size table would protrude much into the main living area. As it is, the table is very elegant following the floor. Since I already have you looking at the floor, check this out. 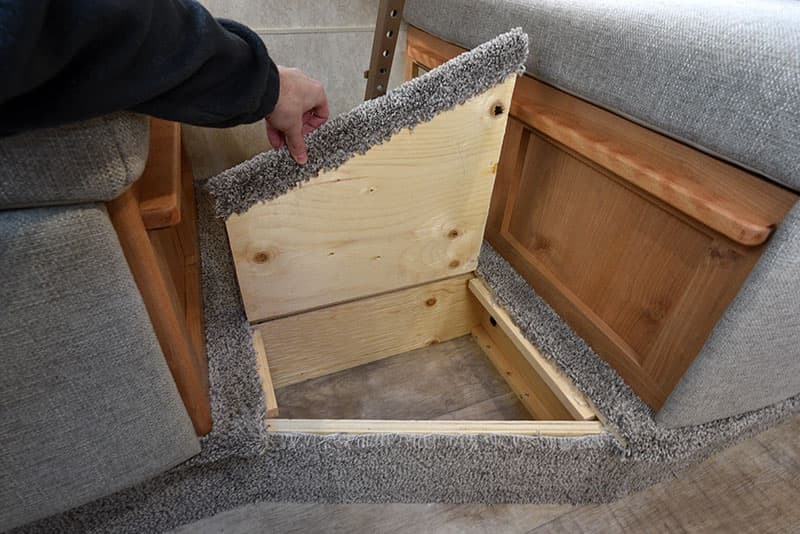 There’s a pull-up storage nook where your feet rest! I’m not sure what we would use this for, but I love the unique storage it offers. The table top and leg system has an adjustable post and trapped hanger design. The advantages of this system are that (a) it’s adjustable, and (b) the table is firmly held by the trapped hanger. 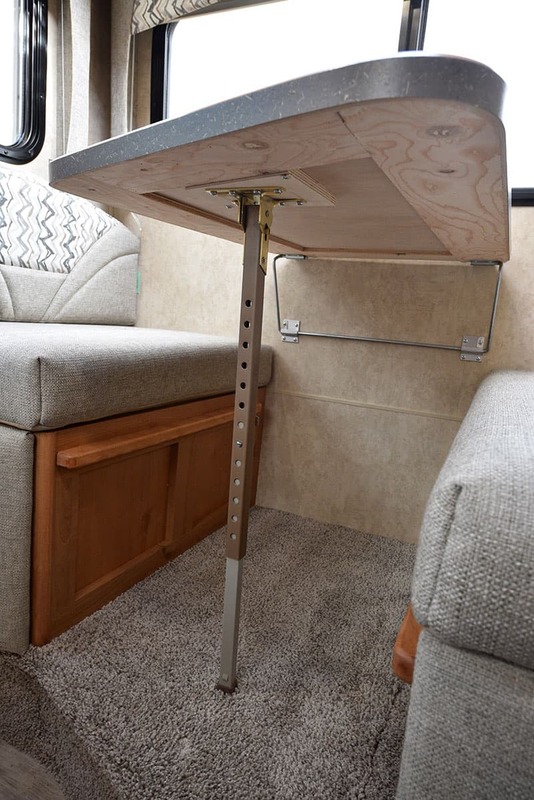 Bigfoot’s trapped hanger system also allows the dinette table to be flush against the side wall. Here we are five seconds later. 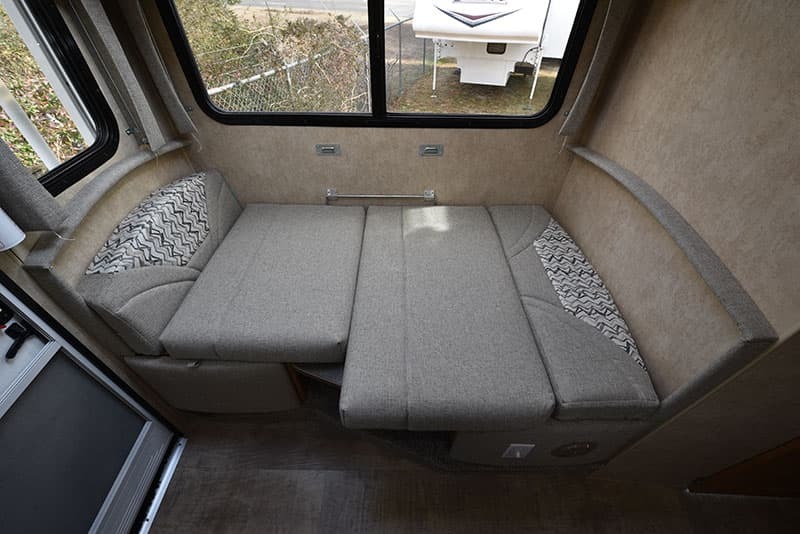 As with the dinette set-up, the bed platform is asymmetrical. The seating cushions assemble into a 5’5” (65 inches) bed. This would be perfect for children, but might be tough for taller adults who prefer to stretch out. The narrow width probably also means the dinette-bed is a single person bed only. I believe this is how Bigfoot intends the bed to be made. I would welcome Bigfoot to submit a Manufacturer’s Comment about this arrangement since the cushions really didn’t fit the bed. Note the cushion at the rear of the dinette in the vertical position. Before reassembling the dinette, I always peek to see what’s under the seats. 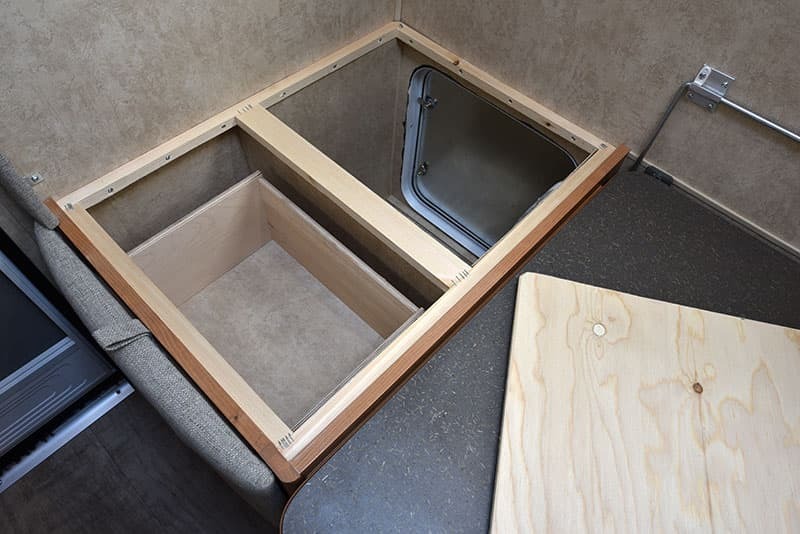 Under the dinette seat against the rear wall is a pull-up platform that accesses the storage drawer and exterior storage compartment. 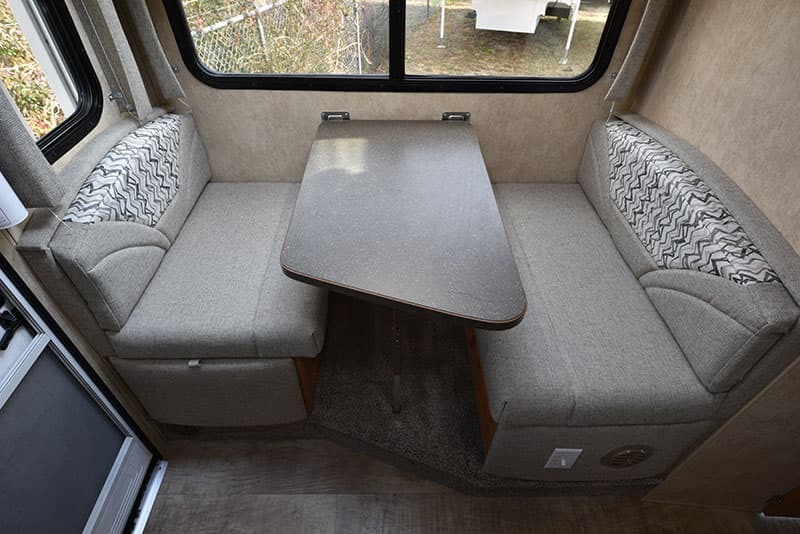 With the midway wood divider, this picture also shows you about how much space two people could possibly have to sit on this side of the dinette. It would be tight, but possible. The aforementioned drawer pulls out to present a welcome storage opportunity. The standard steel roller bearings are another good sign of Bigfoot’s commitment to quality components. Above the dinette are two pull-up cabinets and a standard size (single DIN) car stereo. It’s hard to see in this photo, but behind the stereo is a wide divider that consumes the middle space in the cabinet. Before we move on from the dinette, there’s one more detail that requires examination. 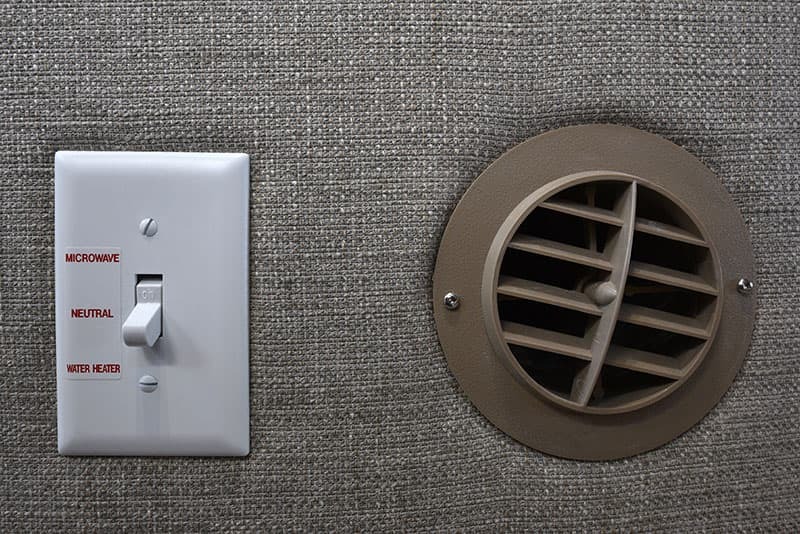 Beside the ducted heat vent, there’s a switch located on the outside of the rear-facing dinette seat. It’s an on-off switch that presumably activates the 110-volt microwave and electric water heater when plugged into shore power (or running the optional built-in generator). Usually, the microwave does not have a switch and the water heater has a dedicated switch (it actually does in the kitchen). I am hoping Bigfoot addresses this in a Manufacturer’s Response. I’m sure there’s a good reason for this switch, but I have no idea what it is.